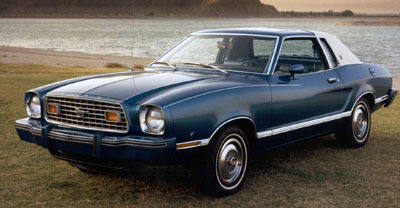 The 1977 Mustang like the 1976 cars, focused on improvements, rather than big changes in mechanical specs, adding features and packages that the public was requesting. Refinements in optional equipment and Decor groups focused on creature comfort, safety and fuel economy. 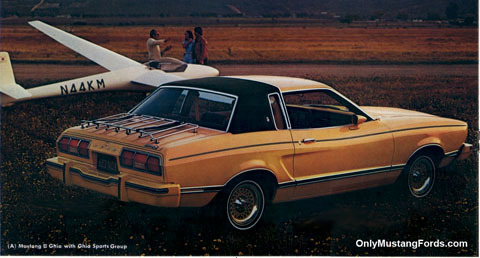 "Uncommon luxury in a sporty car" introduced potential Ford Mustang buyers in the 1977 Ford Mustang's new brochure. 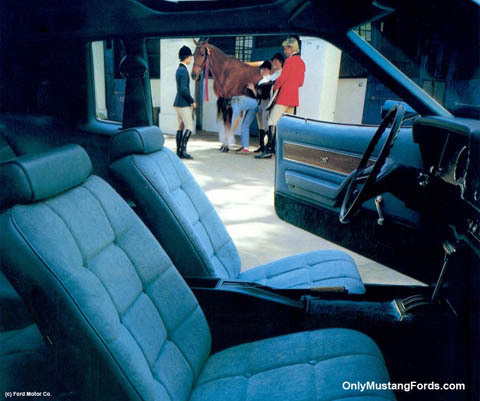 Along with the ultra soft vinyl previous buyers could expect, the new Mustang offered a Media Velour Trim option in Aqua, Chamois or Creme.for those choosing the Ghia, the new cousin to the second generation Grande. 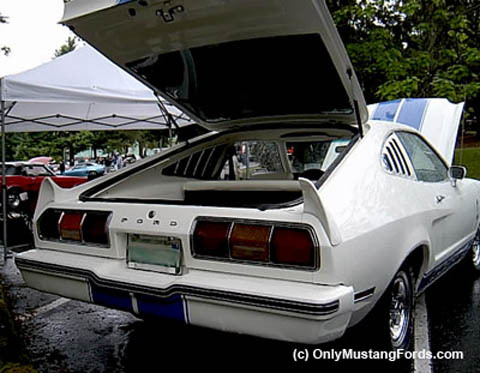 The 1977 Mustang Mach 1 continued in production for it's fourth year, with its distinctive paint and racing stripes and provided the availability of both, V6 and V8 engine options. But its days were numbered, with less than 7,000 units produced,compared to the 49,000 other hatchback Mustangs. One of the most popular and legendary first generation Mustangs was the 1965 Mustang Shelby GT350, a car designed to prove that the new pony car was not as Carroll Shelby had noted "just a secretary's car". 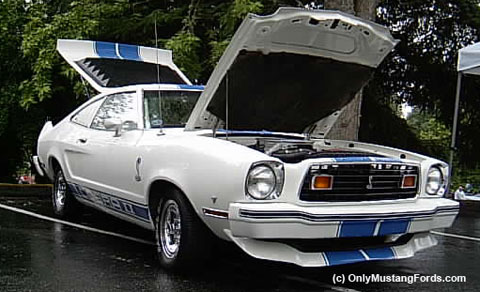 From the front or rear, the blue stripes and Cobra snake on a white background hit all the right notes, making the weight reduced pony car seem to have more power and purpose. The Ghia model, continued to be a popular choice, particularly with women and accounted for almost 19% of all Mustangs sold. Available engines for 1977 included the 2.3 Liter ( 140 cubic inch ) engine with an output of 92 horsepower. The 2.8 Liter V6 ( 171 cubic inch ) motor upped the power level to 103 hp. The big kid on the block, the 5.0 Liter Mustang V8, produced 134 horsepower. Both, the 3 speed automatic and the 4 speed standard transmissions were available. Curb weight stayed around 2,700 lbs, which helped to make the "smog motors" feel peppy for the time. 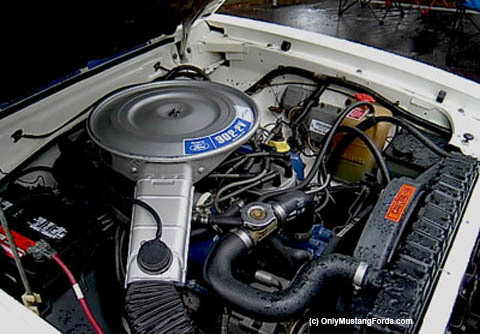 While not exactly a race car or "real muscle car" by late 1960's or early 1970's standards in stock form, that light weight and room for a small block Ford V8 made it a great candidate as a used car for some impressive improvements in reputation. Using today's speed parts and technology can produce some pretty quick Mustang ll race and streetcars as any trip to the local drag race track will prove. Like it or not, the styling remained virtually the same for the 77 model year. The Cobra II package installation, which had been outsourced for 1977, began in house production. The only visible cues to the styling, were the change in location of the Cobra II logos. 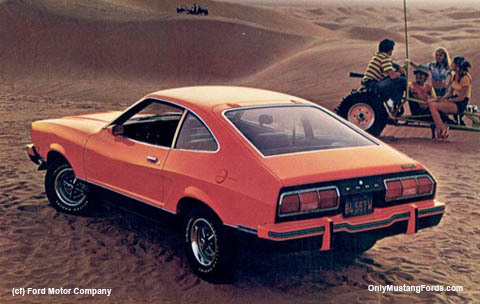 The 1977 Mach 1 continued its 2 tone color keyed paint styling, with 2 tone bumper treatment and the Mach 1 logo near the kick panels. 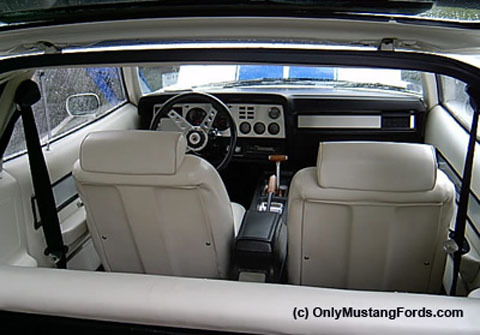 As was typical, with Ford, when a model came closer to the end of it's life cycle, the 1977 Mustang interior received very little in the way of major change. However, while the Cobra package still contained the same type and style of vinyl seats seen in several previous model years, the Ghia's one new improvement was in seating material, offering both velour and new cloth patterned seat coverings. The 1984 Movie Starman saw Jeff Bridges in a huge chase scene featuring a pumped up orange Cobra II.